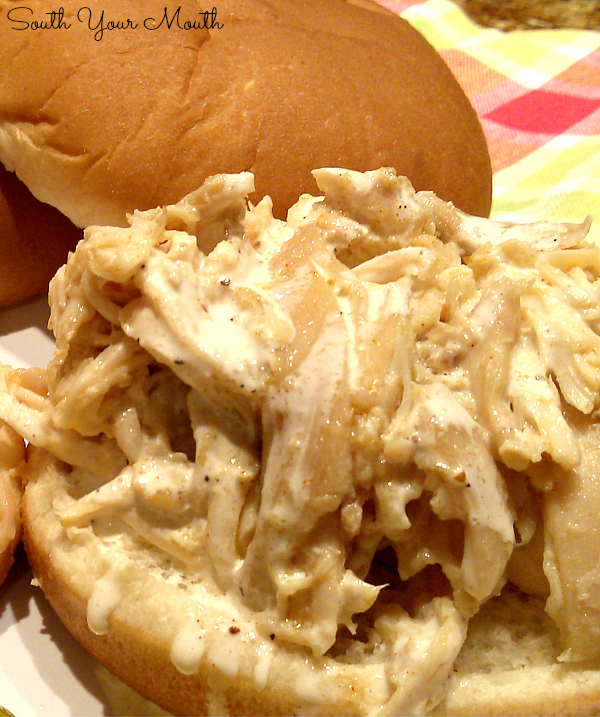 Pulled chicken made in a slow cooker plus a recipe for Big Bob Gibson's White Sauce, a white barbeque sauce popular in Alabama. We had company coming over this weekend and I was looking for something easy to fix that I could just set out and let everyone help themselves when they got hungry. I usually make my Crock Pot Pulled Pork or Crock Pot Carnitas when I'm looking for something like that but I wanted to change things up a bit so I decided to cook a big ol' roasting hen in the slow cooker and see what happened! What happened is that I found a new favorite recipe! 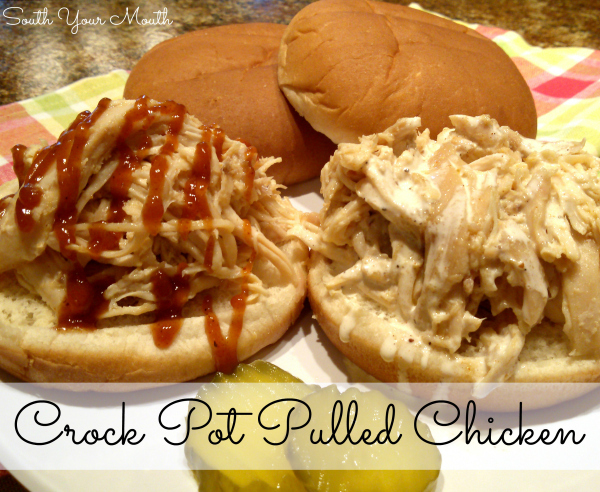 I served the pulled chicken on buns like barbeque sandwiches and had a few different sauces to choose from. This is a great recipe to make when you want to 'fix it and forget it'. You can throw the shredded chicken back into the crock pot, pour a little of the cooking liquid over it to keep it moist and have supper on stand-by. I'd never had white barbeque sauce before but everybody in Alabama swears by it so I thought I’d give it a shot! Combine all the ingredients and blend well. Use as a marinade, baste, or dipping sauce. Store refrigerated in an airtight container for up to 2 weeks. Though I thought it was a little on the thin side, I really liked the flavor! I'd prefer it to be a little thicker and when I make it again will prolly change up the recipe a bit to have more mayo. Wash chicken and pat dry with paper towels. Season chicken all over with Chicken Scratch seasoning. Stuff the onions inside of the chicken, if using. Place chicken in a crock pot (without any water - it will produce its own cooking liquid) then cook on low for 8-10 hours or on high for 5-6 hours. Turn crock pot off and allow chicken to rest for 30-45 minutes, covered. Remove chicken from crock pot (using whatever utensils needed as it will literally pull apart when you remove it – I used tongs and a big slotted spoon), reserving broth for Greasy Rice if desired. Remove skin, bones, etc. then pull/shred the chicken into bite-sized pieces with two forks. 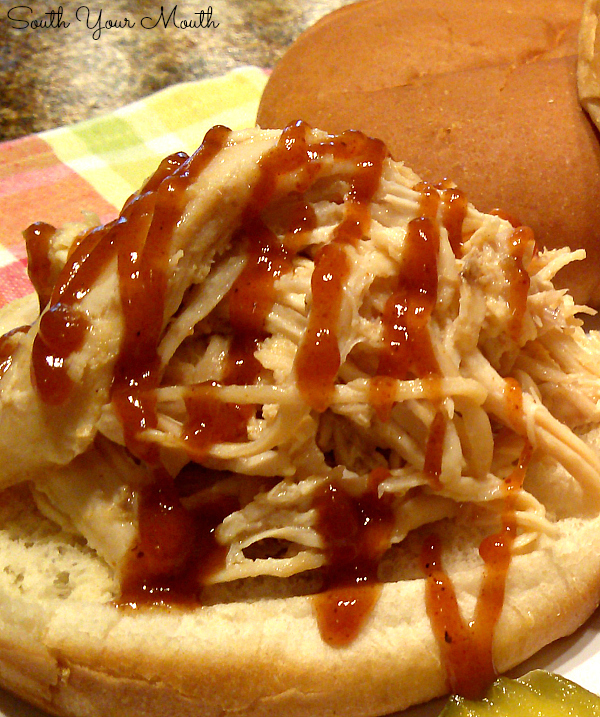 Serve on buns with barbeque sauce to make Pulled Chicken Sandwiches or serve as-is with barbeque sauce on the side if desired. 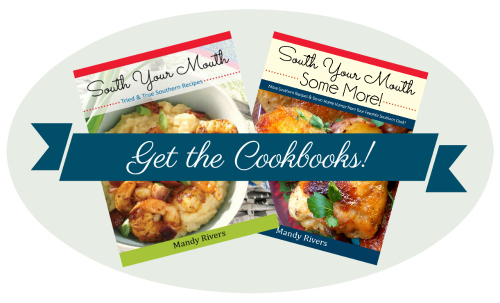 Use leftovers to make chicken salad, quesadillas, chicken pot pie or anything thing else you can think of! This is a seasoning mix I came up with years ago that I use each and every time I cook chicken. The white sauce recipe I got from my mom tastes like Bob Gibsons but gets fairly thick after it sets up in the fridge. But the bob gibsons white sauce you can get in the bottle at walmart is super thin. 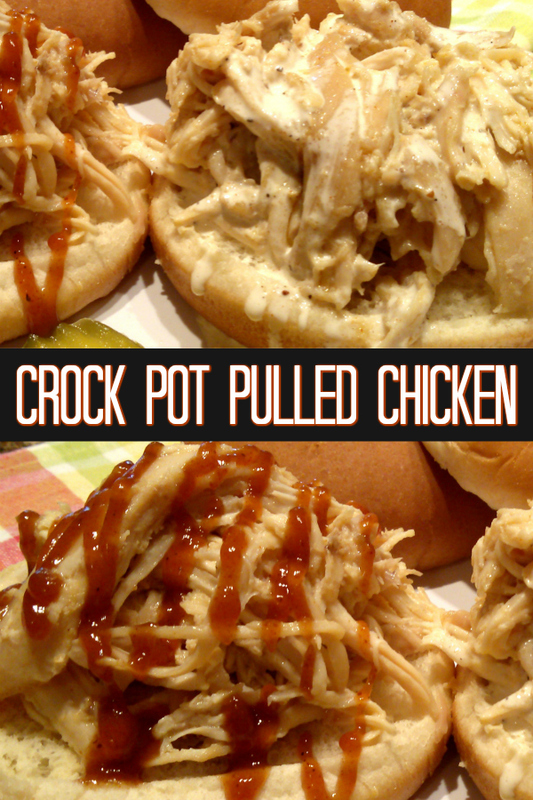 Have you ever tried pulled chicken sandwiches on homemade rolls?? TO DIE FOR. I have a bread maker so it is easy to make them so I ALWAYS make LARGE rolls to put the chicken on. I've never heard of White BBQ sauce. Guess I will have to give it a try! Girl, I can't even make biscuits and you talking to me about homemade rolls?! I WISH!!! That sounds divine! I might have to splurge and get the ones at the bakery! Try the white sauce! It was good! I'd like to baste with it... I bet that's where the magic's at! Just saw your reply! Even my husband who can't cook ANYTHING can make rolls with the bread maker...you can do it! You could also purchase the Rhodes rolls from the freezer section and double them or even triple them up to make giant rolls. I'm telling you...they are AMAZING with bbq chicken!! About how many would this size chicken feed? Thanks! Oh, Lord.... ummm... let's see... we probably made a dozen sandwiches and then I made chicken salad with the leftovers. And I mean, I made a MESS of chicken salad too... we got 8-10 sandwiches out of that. Does any of that drivel help?? OH MY GOODNESS GIRL! This method of chicken cooking has totally restored my faith in crock pot chicken dishes. Dry, bland, stringy, etc. was all I ever seemed to get from the recipes I tried. THIS ONE IS AMAZING! I have made it at least a dozen times in the past couple of months and have used the meat for sandwiches, salad (your chicken salad is divine too!) and casseroles. THANK YOU! Keep up the awesome work! White sauce at THE Bob Gibson's is also thin, but I have grown to LOVE it!